And I'm Barbara Klein with People in America in VOA Special English. Today we tell about James Brown, the musician called "The Godfather of Soul." That was James Brown singing his famous hit song from nineteen sixty-five, "I Got You (I Feel Good.)" With this song, Brown went from a rhythm and blues singer to a pop music star. It helped him gain a huge number of white fans as well as black ones. He became a famous and wealthy singer, songwriter and performer. But this huge success was very different from the poverty of his early life. James Brown was born in nineteen thirty-three in a one-room house near Barnwell, South Carolina. His father, Joe Brown, had a job removing fluids from pine trees in the surrounding woods. He sold the sap for making turpentine. The boy's mother left the family when he was seven years old. James and his father moved to Augusta, Georgia. Young James had musical abilities. He learned to play the guitar, piano and drums. He did this while picking crops in the fields and shining people's shoes to earn money to survive. James loved the African-American church music called gospel. He loved it when the church's religious leader would sing this music and drop to his knees with emotional shouts and screams. Brown later used this kind of emotional singing in his own performances. He also liked the sound of the jazz and rhythm and blues performer Louis Jordan. Jordan had recorded a song called "Caldonia" and other popular songs in the late nineteen forties and nineteen fifties. By the time he was thirteen, James Brown had formed his own music group. He later joined a group called the Flames. The band played at drinking places, restaurants, colleges and other places in the South. These young performers copied the sounds of successful rhythm and blues groups. They also included in their shows a song co-written by James Brown. It was called "Please, Please, Please." This was the song that launched James Brown's career. He was able to stop doing low-paying jobs. He said the success of the song gave him the chance to have some of the things he could not have dreamed of. "Please, Please, Please" was recorded in nineteen fifty-six. It sold more than one million copies. It made James Brown famous in the United States. And it became part of his electrifying stage performances. Brown would be on stage with an eighteen-piece band and a group of dancers. His emotional singing included unusual sounds and screams. He danced around the stage performing movements that had not been seen before. He created his own musical and performing style. That was another James Brown hit song, "Papa's Got a Brand New Bag" from nineteen sixty-five. Brown said that song was one of the most important things he ever did in the way of changing music rhythms. With that song, Brown created the music he called "funk." This later came to be called "soul" music. And James Brown became known as "The Godfather of Soul." He followed this hit a few months later with "I Got You (I Feel Good)", an even bigger hit. James Brown also became known as "the hardest working man in show business." During the nineteen sixties, he performed his exciting show almost non-stop in city after city in the United States and in other countries. At the same time, Brown worked for civil rights for African-Americans. He supported black business ownership as the most important way to what he called "real black power." He urged black people to be proud of themselves. And he urged young people to continue their education and not drop out of school. His message was positive instead of angry. He recorded this song in nineteen sixty-eight, "Say it Loud ( I'm Black and I'm Proud.)" Over the years, James Brown had problems in business, with taxes and in his personal life. During the nineteen seventies, his popularity decreased as disco music became popular. But he made a comeback in the early nineteen eighties, with "Living in America," his first hit in years. In nineteen eighty-six, James Brown was one of the first performers invited into the Rock and Roll Hall of Fame. He became one of the most successful recording artists in history. With the exception of Elvis Presley, no pop artist had more hit records. He had ninety-four songs in the Top One Hundred songs. And he had more Top Twenty single records than any other recording artist up to that time. But, in nineteen eighty-eight, he committed some crimes. He spent two and one-half years in prison. He was pardoned of his crimes in two thousand three. James Brown received a Grammy Lifetime Achievement Award in nineteen ninety-two. He later talked about what he had tried to do to help young people. He said he tried to teach through his music. He thought it was very important to make young people proud of themselves and willing to work for what they wanted. He said life is sometimes really hard, but you can make it a lot better if you try to prepare for it. "If you are an American or you're just a human being and got any blood going through your veins -- AHHOOWW! I feel good!" James Brown performed until the very end of his life and continued to help his community. Three days before his death, he joined volunteers at his yearly event to give toys to needy children in Augusta, Georgia. He had planned to perform on New Year's Eve at B.B. King's Blues Club in New York City. 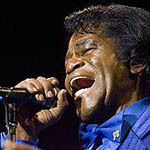 James Brown, "The Godfather of Soul," died December twenty-fifth, two thousand six in Atlanta, Georgia. He was seventy-three. During his fifty-year career, he made many music fans feel good. This program was written by Shelley Gollust. It was produced by Lawan Davis. I'm Steve Ember. And I'm Barbara Klein. You can read scripts and download audio at our Web site, voaspecialenglish.com. Join us again next week for People in America in VOA Special English.